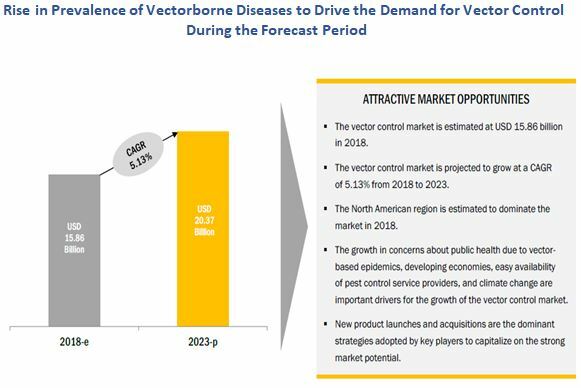 [154 Pages Report] The vector control market was valued at USD 15.12 Billion in 2017 and is projected to reach 20.37 Billion by 2023, at a CAGR of 5.13% during the forecast period. The key players have been identified through secondary sources such as the Pest Management Association (PMA), the US Department of Agriculture (USDA), World Health Organization (WHO), the United States Environmental Protection Agency (EPA), and Federal Insecticide, Fungicide, and Rodenticide Act (FIFRA), while their market share in respective regions has been determined through both primary and secondary research. 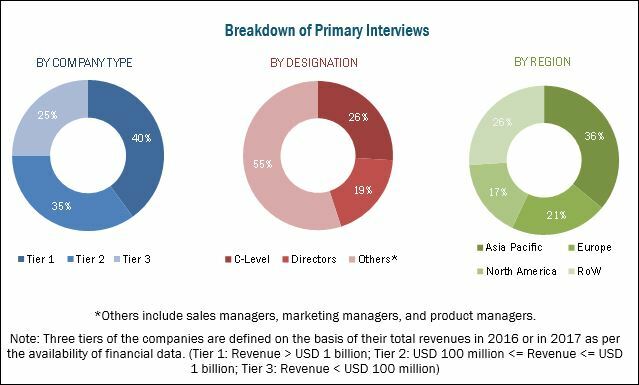 The research methodology includes the study of annual and financial reports of top market players, as well as interviews with industry experts (such as CEOs, VPs, directors, and marketing executives) for key insights (both quantitative and qualitative) for the vector control market. The various contributors involved in the value chain of the vector control market include manufacturers such as Bayer AG (Germany), Syngenta AG (Switzerland), BASF SE (Germany), Bell Laboratories, Inc. (US), and FMC Corporation (US); R&D institutes; service providing companies such Rentokil Initial plc (UK), Ecolab (US), The Terminix International Company LP (US), Rollins, Inc. (US), Anticimex Group (Sweden), Arrow Exterminators, Inc. (US), Massey Services Inc. (US), Ensystex (US); and government bodies, regulatory associations, and world recognized agencies such as the World Health Organization (WHO), US President’s Malaria Initiatives (PMI), United States Environmental Protection Agency (US EPA), and The Federal Insecticide, Fungicide, and Rodenticide Act (FIFRA). This research report categorizes the vector control market broadly based on vector type, method of control method, end-use sector, and region. 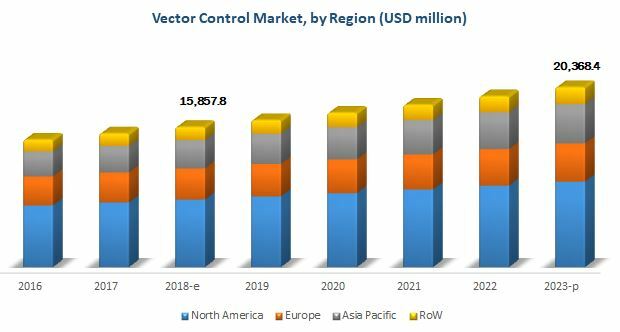 The vector control market is projected to grow at a CAGR of 5.13% from 2018 to 2023, to reach a projected value of USD 20.37 Billion by 2023. The increasing awareness about public health has led to the adoption of vector/pest control services on a regular basis in the residential, commercial, and industrial sectors. On the basis of vector type, the insect control segment accounted for a major share in the market for 2017, due to the rising cases of epidemics caused by vectors such as mosquitoes, cockroaches, bedbugs, flies, and ants across the globe. Promotions by individual country governments and renowned global organizations such as the WHO for the disease/vector eradication programs have also driven the growth of the insect control segment. On the basis of method of control, the biological segment is projected to grow at the highest growth rate during the forecast period. This can be attributed to the growing concerns on the environmental impact of chemical compounds and the rising number of cases of insecticide resistance among pests. Additionally, biologicals are gaining preference as they are perceived to be safer than their chemical-based counterparts. On the basis of end-use sector, the commercial & industrial segment accounted for a larger market share in 2017, due to the increased demand from sectors such as food & beverage manufacturing, food services, hospitality, government organizations, and pharmaceuticals. The demand can be attributed to the need for complying with the local authorities for workplace hygiene and maintenance as a part of the stringent regulations laid by governments. The North American region dominated the vector control method market in 2017 wherein the US and Canada were the major markets owing to the high demand for vector control services in the residential sector, which, in turn, is expected to grow rapidly in the next five years. In the commercial & industrial sector, stringent implementation of regulations is being carried out to ensure the maintenance of the overall standards for safe and hygienic environment. The major restraining factor that affects the vector control industry is the lack of funds in developing countries. Moreover, the environmental hazards associated with chemical-based vector control products also act as a restraining factor in this industry. Alternative methods such as biological-based control methods are increasingly gaining prominence due to their perceived risk-free nature to the environment. The key manufacturers in the vector control market are Bayer AG (Germany), Syngenta AG (Switzerland), BASF SE (Germany), Bell Laboratories, Inc. (US), and FMC Corporation (US). The key service providers in the industry are Rentokil Initial plc (UK), Ecolab (US), The Terminix International Company LP (US), Rollins, Inc. (US), Anticimex Group (Sweden), Arrow Exterminators, Inc. (US), Massey Services Inc. (US), and Ensystex (US).